The low-cost sensors are being deployed across the capital to monitor rainfall, weather conditions and river levels. 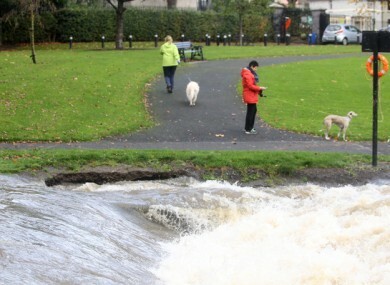 File photo of the river Tolka in Dublin flooding in 2014. DUBLIN CITY IS getting new ‘smart’ rainfall sensors to give it an early-warning system to protect against flooding. The sensors will work by communicating data wirelessly to Dublin City Council’s operations team, who will then be able to analyse water levels and take appropriate action. The sensors will work by using an “Internet of Things” network called Pervasive Nation and developed by the CONNECT Centre, a Science Foundation Ireland Research Centre at Trinity College Dublin. The Internet of Things is the interconnection of various computers embedded inside everyday objects (for example fridges, lights, clock, etc) which allows them to send and receive data. The point of the pilot scheme will be to give an early-warning of potential flooding across the Dublin region. The initiative is part of the Smart City project. Programme manager Jamie Cudden said that some initial flood monitoring had already been carried out across the city, which led to the prototyping of a set of river and rainfall sensors. “Projects like this demonstrate how low-cost environmental sensor networks can be scaled to generate useful and actionable flood data for communities living across the city,” said Crudden. The second part of the project will involve scaling these river and rainfall sensors to more locations across the city. The sensors are currently being rolled out in a number of locations across the city, including Ballymun Library, the Bannow Road Drainage Depot in Cabra, the storm overflow tank in Clontarf, and at the UCD campus in Belfield. The project is a joint initiative between the four Dublin local authorities, CONNECT and Intel. Professor Linda Doyle, director of CONNECT, said the project was a good example of how the Internet of Things can be ”of practical benefit to citizens”. Email “Smart rainfall sensors are being used in Dublin city to give an early-warning defence from flooding”. Feedback on “Smart rainfall sensors are being used in Dublin city to give an early-warning defence from flooding”.